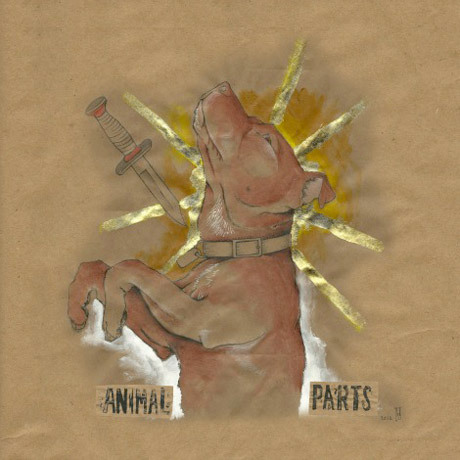 Considering this self-titled offering is only his second release, Animal Parts’ frontman Joshua Cockerill demonstrates an excellent gift for song-craft, certainly one beyond his relative inexperience. Plenty of rootsy moods, a little pop and a few strong narratives each come together to make a record that has plenty of emotional pull. The quirky ‘Poets’ is an instant standout, it’s mix of acoustic guitar, new wave keyboards and handclaps come together in a way which manages to be reminiscent of an early 80s power pop band reimagined by Wilco. Vocally, the underplayed harmonies are great, while with his lead vocal delivery, Cockerill knows he has a natural sense of style – he doesn’t have to use any quirks or unnecessary affectations to catch the ear. Another great jangler, ‘I Won’t Ever Let You Down’ breezes along with a sunny optimism, its tune recalling the best indie-pop of the 1990s. While the bouncy air and simple chorus are the things which are likely to be considered the most striking about this particular number, its bass part should not be overlooked – the production values here really bring out the best in the performance. It may not be completely original, but it is so well performed, it’s near impossible to dislike. Although never flashy, ‘King of Kings’ is another instantly likeable offering, again hinting at a love of 90s jangle-pop/indie. Throughout the bulk of this tune, Cockerill and his Animal Parts sound positive, bringing a real spark to their performance. Despite this, it is not the song’s main part which ends up being its most memorable (even with a drum part that tips the hat to Phil Spector…) The real stroke of genius here comes during the songs coda, where Cockerill throws out huge ugly slabs of guitar drenched in levels of reverb which would befit Neil Young & Crazy Horse. The influence here is as subtle as a brick – particularly reminiscent of ‘Don’t Cry’ from Young’s 1989 album ‘Freedom’. Still, given this band’s Canadian heritage and their love of roots-rock, gaining influence from the mighty sideburned one was inevitable. While those upbeat tunes sound great from first listen, it doesn’t take too long before some of the rootsier material proves to be just as enjoyable…and perhaps even more so. With just a finger-picked guitar leading the way ‘Running’ starts out very wistfully, with Cockerill’s voice taking the weight of the melody, its natural tone pulling in the listener once more. His delivery wobbles a little, like a man who could crack at any given moment, but that’s half the charm – it’s an absolute pleasure to hear a voice that’s not been shined to perfection with various studio filters. The slow and lumbering ‘Dream Where I Break Horses’ offers a particularly memorable lyric, blending thoughts of hours spent equine training in potentially lonely surroundings with a tune that would befit many of Animal Parts’ country-rock influenced predecessors. The aching, country tinged lead voice works especially well with a slightly reverbed drum, electric piano and soft cello drones, creating an absolutely unmissable tune, which in the hands of Son Volt – for example – would quickly be heralded a genre classic. Also from the top drawer, ‘The Bird Song’ places Cockerill upfront with just an acoustic guitar and quiet voice. The finger picked acoustic notes are quiet and almost disjointed; with an incredibly sparse backdrop, the tune is wholly at the mercy of the vocal to carry any emotional weight, but the performance is more than up to the task in hand. Fragile, beautiful, almost painful – this is Animal Parts laid bare. A warm bass and droning crescendo fills any gaps at the inevitable climax. If alt-country is your bag, you’ll totally dig this…and then some. It’s a close contender for this album’s finest offering, but it’s just pipped by the masterful ‘…Break Horses’. While you may be able to spot a few obvious influences on this release, that doesn’t weaken its impact. With a perfect balance between chirpy pop/rock and darker alt-country suffering, ‘Animal Parts’ is a great record which comes highly recommended. This entry was posted in americana by Real Gone. Bookmark the permalink.